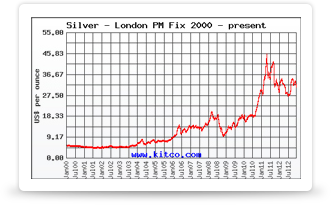 Having decided to invest in silver, you might be wondering how best to go about it. What type of silver should you invest in? There are physical silver bullion bars and coins, as well as paper silver certificates, exchange traded products, accounts, mining stocks, and futures. The option that you choose to invest in should fit your investment needs. If you’re looking for a short term investment, find an option that is easy to get your hands on and highly liquid. For a long term investment, find something that is relatively stable and will grow. Bullion is good for this purpose. Once you’ve decided which investment to make, you’ll need to figure out where to actually make the purchase to provide you the best price and product. Silver can be bought both online and in person. Online dealers are just as reputable as visiting a dealer in person, and provide the convenience of never having to leave your home. Silver bullion bars and coins can be bought online in both new and secondhand conditions. If you’d prefer to visit a dealer in person, you can look in your local directory for coin dealers near your area. Buying from a local dealer in person is beneficial because you can haggle and get a good deal as well as build rapport. As a first time investor, your knowledge of silver won’t be extensive. Learning from someone who deals in that area is beneficial as you can learn more about silver as well as make new contacts. Coins can also be bought directly from government mints in uncirculated “mint” condition. Popular coins include the American Silver Eagle and Canadian Silver Maple Leaf. For a great deal, consider buying “junk coins”. These are coins that contain the standard amount of silver used in government coins, but have little collectable value. You can buy silver at well below spot price with junk coins. If you’d like to buy certificates, consider the Perth Mint Certification Program. This is the only Government Guaranteed program in the world. These offer allocated and unallocated accounts where they hold your silver in trust for you on a fully insured basis. Another place to invest in silver is the stock market. You can purchase Silver ETFs or mining stocks, allowing you to gain access to the metal’s price movements without taking physical delivery or opening up a new account. Nearly all stock brokerages allow ETF trading, making ETFs a low cost and highly liquid way to gain access to the metal.